TheCapitol.Net, an independent non-partisan small business, has been selected as a subcontractor on numerous training contracts. TheCapitol.Net is on the GSA Schedule, 874-4, for custom on-site training. We have been selected as a subcontractor on large and on-going contracts for leadership development training. Prime contactors include Booz Allen Hamilton, Bechtel, Viva Productions, and others. TheCapitol.Net and its predecessor, Congressional Quarterly Executive Conferences, have been performing contract work for the agencies of the federal government for more than 40 years. We have designed and conducted hundreds of custom training programs for all levels of government. Our independent faculty, who are all subject-matter experts, conduct all of our custom training. Our custom training course materials often include our practical publications written by subject matter experts. TheCapitol.Net accepts all forms of payment methods for custom training, but we prefer payment by check or EFT. TheCapitol.Net is a Virginia Corporation, registered in CCR / SAM. PO Box 25706, Alexandria, VA 22313-5706. If you need a Form W-9, we have a pre-filled version here (1-page PDF ) or contact our registrar: 202-678-1600, ext. 112. For more information about TheCapitol.Net, please see our About Us page. Email us: complete our custom program information request for more information. TheCapitol.Net is a non-partisan firm, and the opinions of its faculty, authors, clients and the owners and operators of its vendors are their own and do not represent those of TheCapitol.Net. 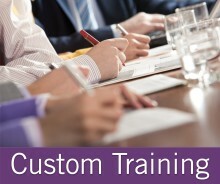 All custom training from TheCapitol.Net is tailored for each organization and audience. Topics from this program can be combined with topics from our other programs and with topics from your existing training programs. See what some of the attendees at our custom programs say about our custom training. Our faculty includes more than 50 core trainers, all of whom are independent subject matter experts. To help you publicize and market a custom program to your organization's audience, we can provide printed materials and language for your own internal promotion and publicity.